Rep. Steve Scalise (R-LA) joined Laura Ingraham on The Ingraham Angle on Wednesday night to discuss the latest Democrat legislation to restrict gun rights. Scalise told Laura the latest plan by Democrats will make it illegal to loan a shotgun to a friend for hunting. Rep. Steve Scalise: Go read their bill by the way. If you loan your shotgun to a friend of yours to go hunting under certain circumstances in their bill you can actually go to jail for year and pay $100,000 fine. 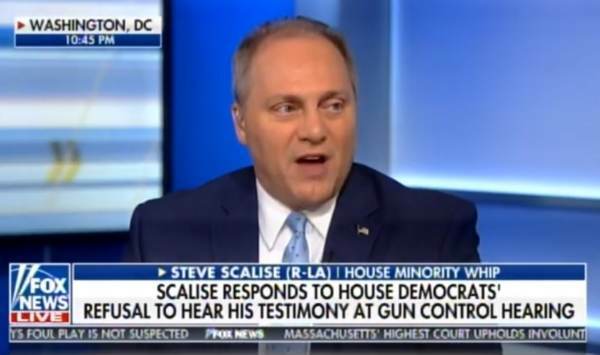 The post Rep. Scalise: Democrat Anti-Gun Bill Makes It Illegal to Loan Shotgun to Friend for Hunting– With One Year in Jail and $100,000 Fine (VIDEO) appeared first on The Gateway Pundit.